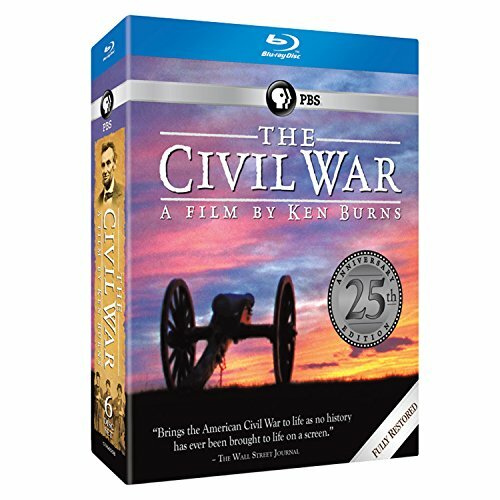 Arlington, Va. - August 31, 2015 - PBS Distribution announced today it is releasing The Civil War 25th Commemorative Edition on DVD and Blu-ray. Now fully restored to achieve the highest definition for optimal picture quality, the release coincides with the 25th anniversary of the original broadcast of "THE CIVIL WAR", and the 150th anniversary of Abraham Lincoln's assassination. The Civil War 25th Commemorative Edition will be available on DVD and Blu-ray October 13, 2015. The run time of the DVD and Blu-ray is approximately 700 minutes on 6 discs. The DVD SRP is $99.99 and the Blu-ray SRP is $129.99. The program will also be available for digital download. In addition, the DVD and Blu-ray includes two hours of bonus features, including "The Making of The Civil War 25 years later", uncut and re-mastered Shelby Foote interviews, and more. "THE CIVIL WAR" attracted an audience of 38.9 million during its premiere in September 1990. It set a record for the highest rated PBS series broadcast, which stands today. The New York Times said that Ken Burns "...takes his place as the most accomplished documentary filmmaker of his generation." The Washington Post said, 'This is not just good television, nor even just great television. This is heroic television.' The columnist George Will added, 'If better use has ever been made of television, I have not seen it and do not expect to see better until Ken Burns turns his prodigious talents to his next project.' The series has been honored with more than 40 major film and television awards, including two Emmy Awards, two Grammy Awards, Producer of the Year Award from the Producers Guild, People's Choice Award, Peabody Award, duPont-Columbia Award, D.W. Griffith Award and the Lincoln Prize, among dozens of others. While Burns had directed and produced other award-winning films on PBS prior to "THE CIVIL WAR", including his first feature film, the Academy Award-nominated THE BROOKLYN BRIDGE (1981), "THE CIVIL WAR" quickly became the standard for historic documentaries. Over the course of two months, 50,000 feet of the original 16mm film negative, which is preserved at the George Eastman House, was scanned frame by frame at 4K (4096 x 2160 pixels, the resolution used for Ultra High Definition). The standard definition 1990 broadcast was taken from a duplicate of the original negative, resulting in a loss of quality. This is the first time the film will be seen with the exact same fidelity and framing as the negative that Burns and his co-cinematographers Allen Moore and Buddy Squires shot over 25 years ago. Sam Waterston (Abraham Lincoln), Julie Harris (Mary Chesnut), Jason Robards (Ulysses S. Grant), Morgan Freeman (Frederick Douglass), Paul Roebling (Joshua L. Chamberlain, etc. ), Garrison Keillor (Walt Whitman, etc), George Black (Robert E. Lee), Arthur Miller (William T. Sherman), Chris Murney, (Pvt. Elisha Hunt Rhodes), Charley McDowell (Pvt. Sam Watkins), Horton Foote (Jefferson Davis), George Plimpton (George Templeton Strong), Philip Bosco (Horace Greeley, etc. ), Terry Courier (George McClellan), Jody Powell (Stonewall Jackson, etc.) and Studs Terkel (Benjamin F. Butler). Others who provided voices include Derek Jacobi, Pamela Reed, Jeremy Irons, Ronnie Gilbert, Kurt Vonnegut, Colleen Dewhurst, Hoyt Axton and Shelby Foote. The restoration of the program was done by Daniel J. White and supervised by Paul Barnes (lead editor of The Civil War ) of Ken Burns's production company, Florentine Films, in association with the George Eastman House. Funding for the restoration was provided by Bank of America, PBS and The Corporation for Public Broadcasting. The Civil War was directed by Ken Burns; produced by Ken Burns and Ric Burns; written by Geoffrey C. Ward, Ric Burns and Ken Burns; edited by Paul Barnes, Bruce Shaw and Tricia Reidy; cinematography by Ken Burns, Allen Moore and Buddy Squires; coordinating producer Catherine Eisele; associate producer Lynn Novick; co-producers Stephen Ives, Julie Dunfey and Mike Hill. WETA Washington, DC, is the third-largest producing station for public television. WETA's other productions and co-productions include PBS NEWSHOUR, WASHINGTON WEEK WITH GWEN IFILL AND NATIONAL JOURNAL, THE KENNEDY CENTER MARK TWAIN PRIZE, IN PERFORMANCE AT THE WHITE HOUSE, THE LIBRARY OF CONGRESS GERSHWIN PRIZE FOR POPULAR SONG and documentaries by filmmaker Ken Burns, including THE CIVIL WAR, THE WAR, THE NATIONAL PARKS: AMERICA'S BEST IDEA, THE TENTH INNING and PROHIBITION. More information on WETA and its programs and services is available at www.weta.org.